Glastonbury, the Ancient Isle of Avalon in Somerset, England, was the site of an interesting discovery when timber roads were discovered in a swampy area. Glastonbury, known for King Arthur’s legends and believed to be the actual site of Camelot, has had a pilgrimage since ancient times as it is home to Glastonbury Abbey. Bringing much early “traffic” into the area and requiring roads for the transportation of carts and animal-drawn wagons, the timber roads served the purpose, but more advanced roadways were in the future. Country roads in “Small Town America” now paved. Strangely, a Scottish man named John Metcalfe, born in 1717 and blinded at age six, built many miles of roads and bridges in Yorkshire, England. The roads were built in three layers: large stones, a mixture of road material, and a layer of gravel. Two other Scottish engineers, Thomas Telford and John Loudon McAdam are credited with the first modern roads. They also designed the system of raising the foundation of the road in the center for easy water drainage. Telford improved road building further by analyzing stone thickness, road traffic, road alignment and gradient slopes. Sound familiar? This method became the norm. Telford is well known for many engineering successes involving bridges, canals, roads, harbors and docks. The Menai Suspension Bridge in North Wales, completed in 1826-is considered one of the greatest examples of iron works ever built. McAdam, born in 1756, designed roads with harder surface using broken stones placed in symmetrical, tight patterns and covered with smaller stones. His design was called “Macadam” after his name, and was a huge achievement in road construction in the 1800s. This design led to the bitumen-based binding called Tarmacadam. One of the first “tar” roads was laid in Paris. The famous Champs-Elysees of the 1600s was covered with asphalt in 1824 signifying it as the first modern road in Europe. By the late 1800s, America would be paving roads. One of the first was Pennsylvania Avenue in Washington D.C. Were you born before the electronic crosswalk signs? On February 5, 1952, the first “Don't Walk” automatic signs were installed in New York City. Today in America, most of our roadways and streets are paved with asphalt concrete. Asphalt concrete is a simple product in appearance produced primarily by adding asphalt cement to sand and rock. 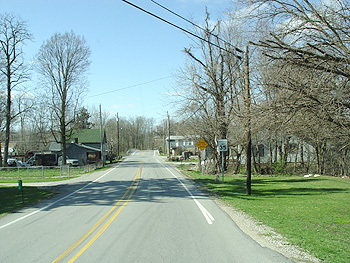 According to Bob McQuiston, FHWA Pavement and Materials Engineer for the FHWA Ohio Division, however, that simple appearance can be very deceiving. In highway applications today, especially on the heavily trafficked, heavily loaded Interstate System, special care must be taken to ensure adequate performance of the pavement. For example, asphalt cements today are often modified with various products, such as polymers, to provide added stability to the mixture and avoid both displacement under traffic and fatigue-related distress. At the same time, the “binder” selected must remain soft enough during cold winter periods to minimize thermal cracking. Special criteria often apply to the sand or “fine aggregate” component and the rock or “coarse aggregate” in the mixture. High quality and very durable fine and coarse aggregates are crushed to an angular shape and properly sized prior to incorporation in the final product to provide additional stability to support heavy truck loading. Pavements built today can be engineered to meet a variety of needs-greater durability, enhanced skid resistance to improve safety; and, a smoother ride to satisfy the traveling public. 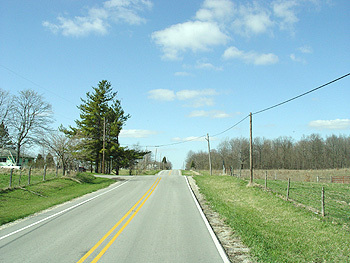 Paved roads allow for quicker travel and a smooth ride. Whether constructing a new pavement or preserving an existing one, asphalt meets many of today’s needs in maintaining our extensive highway network in the United States.